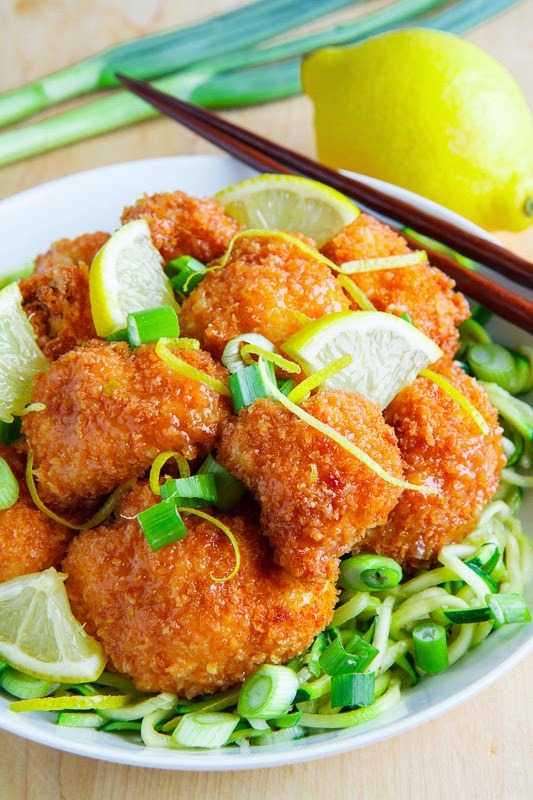 Crispy fried cauliflower in a tasty honey and lemon sauce served over a bed of tender zucchini noodles. 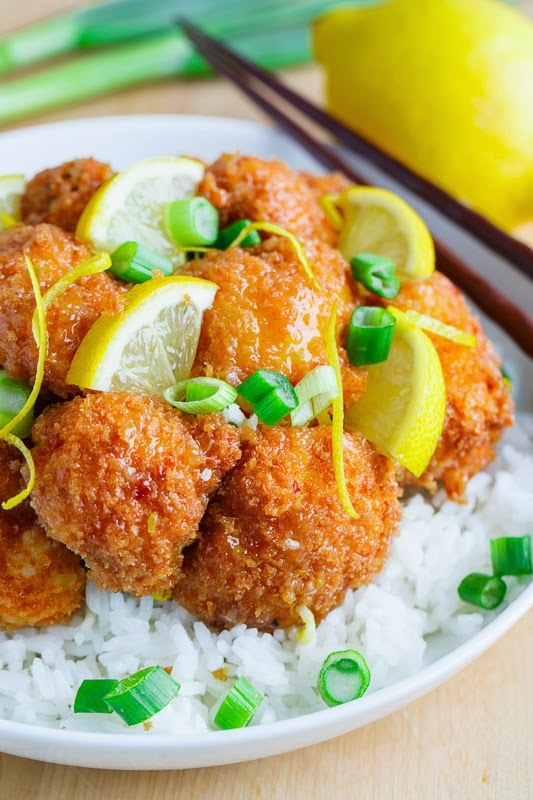 After recently making the crispy parmesan cauliflower bites I could not help but think that crispy cauliflower could be used in other recipes and the thing the that stuck out in my mind was using it to replace the meat in a Chinese style dish like honey lemon chicken. Normally when I am making a Chinese style dish where the meat is coated and fried until crispy I take a lighter approach and use simple sauteed meat but since the meat in this case is actually cauliflower I thought that it would be alright to indulge a bit and go with the crispy coating. 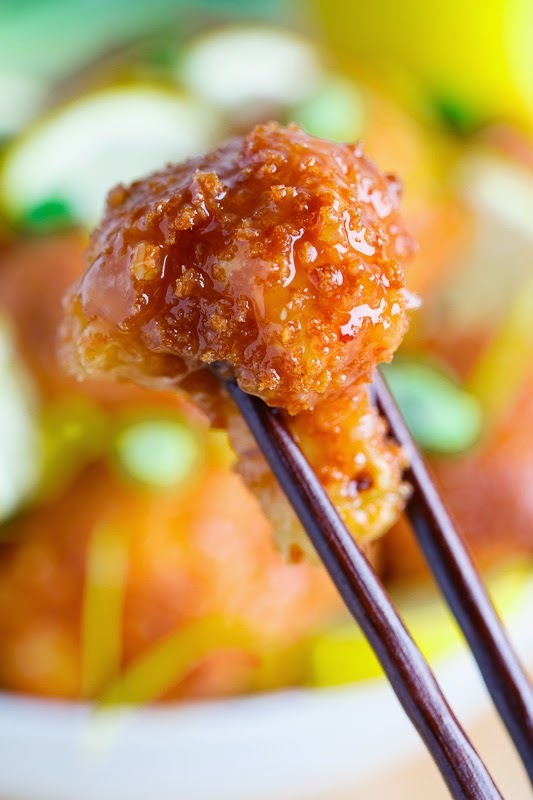 The honey lemon sauce is super quick and easy to make starring, you guessed it, honey and lemon along with some other Chinese style sauce staples including soy sauce, garlic and ginger. You will definitely never miss the meat in this dish as the crispy cauliflower is absolutely amazing in the tasty honey lemon sauce! I served the crispy honey lemon cauliflower over a bed of zucchini noodles stir fried with some garlic and a touch of chili heat to keep things nice and light. Feel free to serve the honey lemon cauliflower over rice if you wish but the zoodles are so good! Working in batches dredge the cauliflower florets in the flower, dip into the eggs, and coat in the breadcrumbs before frying them in oil heated to medium-high (~350F/180C) until golden brown and setting them aside on paper towels to drain. Heat the oil in a pan over medium-high heat, add the garlic and cook until just fragrant, about 30 seconds, add the zucchini noodles and saut?© until just tender, about 2-3 minutes. Heat a pan over mediumh heat, add the mixture of the honey, lemon juice, soy sauce, broth, chill sauce, lemon zest, garlic, ginger and the mixture of the water and the corn starch and cook until the sauce thickens, about a minute, before adding the crispy cauliflower and tossing to coat. 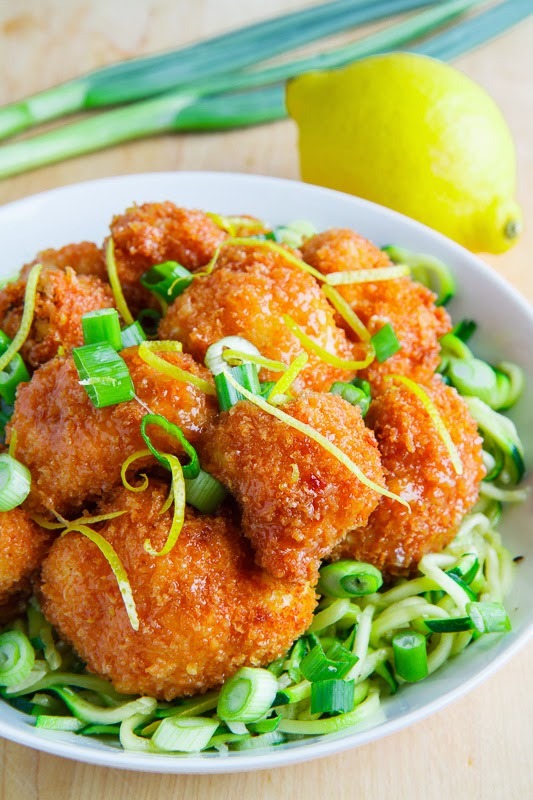 Serve the cauliflower immediately over the zucchini noodles garnished with green onions. This is SUCH an awesome idea for a delicious vegetarian meal! Love that you served these on zucchini noodles! Such a delicious meal Kevin! Love this recipe! Can't wait to try it! These look amazing!! I LOVE that outer crispy crust!! this is just so cool Kevin! What an awesome Idea! I have a spiralizer begging to be used. This would be perfecto for Lent. Thanks! My kids will LOVE this chicken!! OMG that cauliflower!! I really thought it was chicken. Definitely trying this! How did you make the zucchini noodles/zoodles? Have you ever used (sea tangle) kelp noodles? They're not quite as soft as regular noodles, even after slow-cooking for 10 hours, but they're also a nice alternative to pasta! Do you ever use a slow cooker for anything? I'd love to find a crock pot recipe for (fresh, not canned) tomato soup! Any suggestions? Sorry, almost forgot.. what kind of wok/pan do you use to stir-fry? And would a higher smoke point oil be healthier, albeit alter the flavor slightly? I'm thinking of avocado or macadamia nut oil. Thanks! Looks Yummy. All your recipe dish photos are beautiful. Good Job! When I see a recipe with great photo it makes me want to try the recipe even more. Such a fun recipe, Kevin! LOVE this. Looks so great for a wonderful weekend. That is such a nice and tasty meal. This is right up my alley! I am dying for this lemony goodness right now! Love these flavors Kevin! Looks great! Kevin, OH MY GAWD! I love this!!! 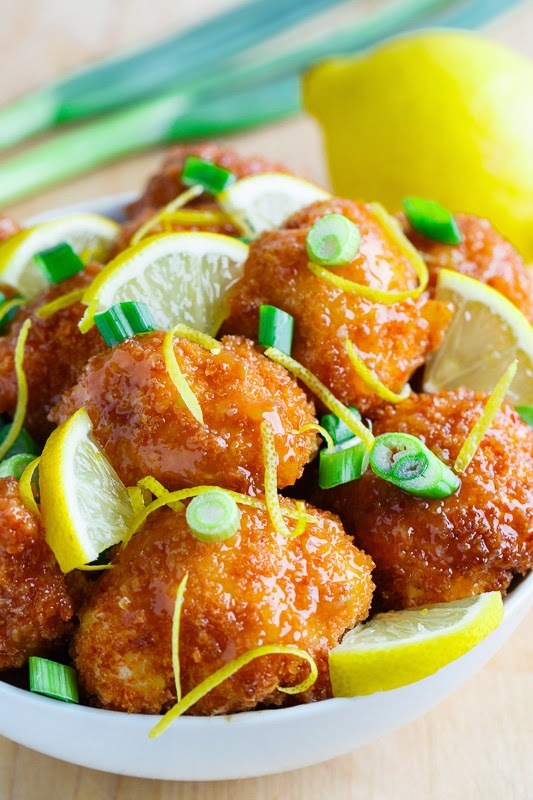 I love cauliflower and love the Asian spin here. . totally going to try this!!! ben: I used a spiralizer but a mandoline would also work to make the zucchini noodles. I have never tried kelp noodles but now I will have to look for them! I do use a slow cooker but mostly for pulled meats, braised meats and long simmered soups. I would say that you could use a slow cooker canned tomato soup recipe and just use fresh diced tomatoes instead. (I would probably roast the tomatoes in the oven first to bring out more flavour but that would take extra time.) I am just using a cheap wok with a small flat bottom on the outside that can be used on my old electric stove. I tend to go with peanut oil for high temps but other high temp oils would also work and you would not have to worry about peanut allergies. This looks so good. I love cauliflower and how ingenious to sub it in for the meat, I'm definitely making this one tonight!